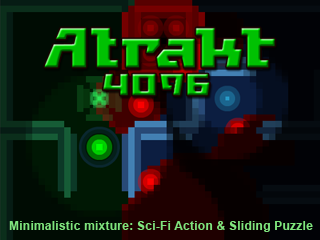 Atrakt 4096 Post-Compo - minimalistic Sci-Fi Action / Sliding Puzzle ! 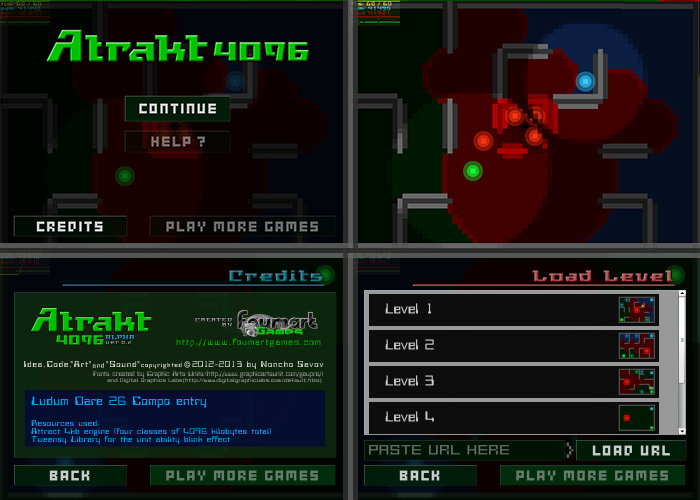 Level based game, involving not only exploring and fighting, but planning and strategy as well. It was updated several times, still has alot of issues and bugs (apologize for any bad experience). The theme of the competition was Minimalism. System requirements: A lot of processor power .. sorry but I haven't applied any optimizations yet. SPACE (HOLD) - Green Player activates EMP shockwave; Blue Player confuses enemiy with Nightmare. SPACE (HOLD and release early) - Green Player looks around; Blue Player becomes invisible. Theme: Minimalism - the most minimalistic aspect of this game is it's level design / storing mechanism that allows an entire level (plus the enemy behaviour) to be saved in a total of 256 bytes. Story: Atrakt 4096 is the name of a spacecraft which during interstellar voyage is invaded by alien. All of the spaceship's passangers are lying in stasis (cryo-sleep). Only two are awake: the Green Scout and the Blue Wraith. Their mission is to eliminate all Alien spawns and save the spaceship's crew from certain death. The Scout is slow but possesses the handy EMP shockwave ability. The electromagnetic pulse stuns all enemies wihin area of effect. That makes the Scout a worthy opponent for the red foes. While being one of the fastest units the Blue Wraith also possesses the ability to become invisible. Along with his Nightmare Wail that adds confusion along the enemy lines you have a perfect spy on your side. The Red Aliens are tough and fast. Moreover they benefit by their permanent fireshield and are physically melee invulnerable against the Green or Blue. This units also effectively will blow or distract your explosives by all means. Player must guide such an automated defense mechanism and install it inside the Red Base. If you have enought devices you can first make a way through the base's firewall with the some explosive blasts. Explosion outside the base can disarm one of the four firewalls. Atrakt 4096 copyrighted © 2013 by Noncho Savov. All Rights Reserved.